Lobby in Mermaid Cove and Engine Black overhead. 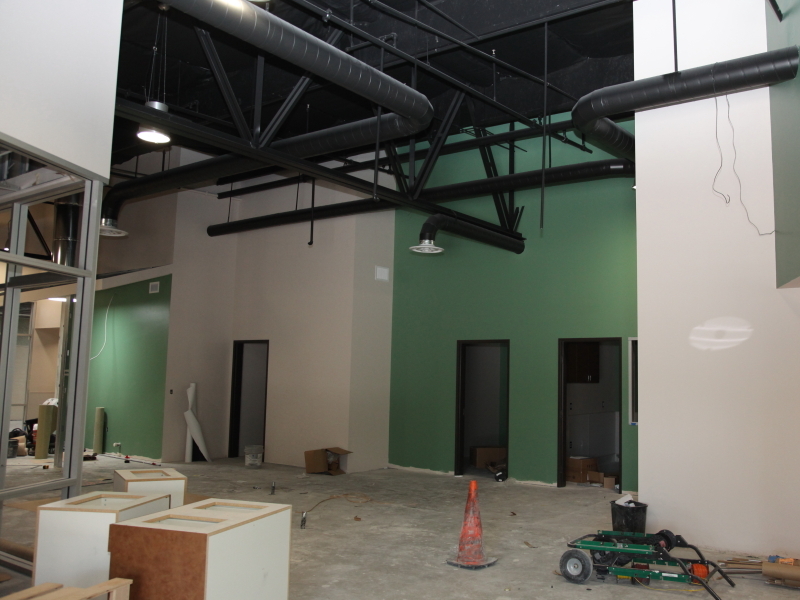 Word in from my deputies is that things are looking pretty spiffy over at the New Animal Services Facility on Capitol. As you can see from this image of the Lobby the “Mermaid Cove” green goes well with the “Engine Black” they have done the duct work and overhead area in. I really like the way staff decided to do the color scheme of my new abode. The on-line Feng Shui class I am taking when the computers get left on has really been fun and helps me understand more about these sorts of things. It is a Chinese philosophical system of harmonizing everyone with the surrounding environment. The term feng shui literally translates as “wind-water” in English. 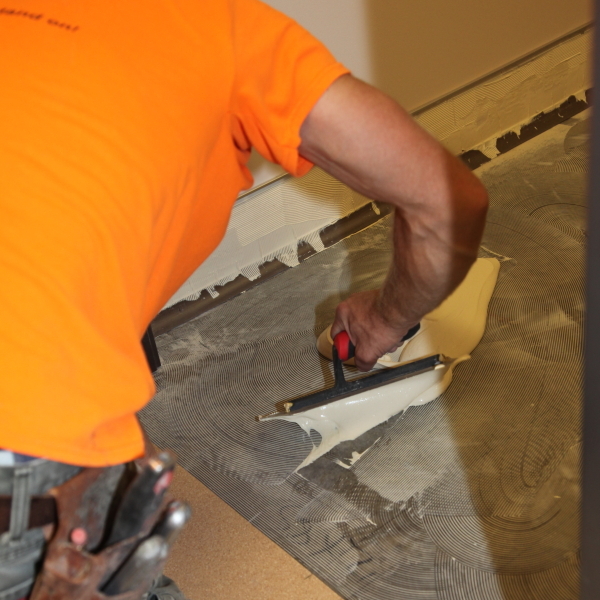 1/32″ grooved trowel is used to apply the glue for the linoleum. The flooring guys are busy over at the new place this week and will be for a while yet. There is a lot of flooring to go in. They have an assortment of special knives and trowels and the like they use to put the linoleum down. You can see they are meticulous and take great care in their work. The pictures of the tall ladders are still intriguing to me but I am even more curious about all of the cool cabinets going in. – So many new places to nap. – I was looking at the image of the plan and there is even going to be a kitten room so they won’t disturb my naps and it will give me a good place to tutor them in proper cat behavior as well. And the housing for the horses, I will get to visit at the new facility, it has its foundation in. The walkway to keep my feet clean on the way out there will be done next. The Finishing Touches Campaign is still going strong, the first set of donor tiles are ordered and we only have a bit more to raise for Cat Condos and Dog turf. So take a gander at the photo gallery below and revel in the progress being made and the possibilities it will unleash. here. They are just too tempting for any cat and since their adoption fee is sponsored, well it would just be a really good idea to take one home to your house so they don’t torture me any further. I am well educated but I am still a cat remember. You can check them out on http://www.petharbor.com they are at the EDC Animal Services Placerville Shelter. 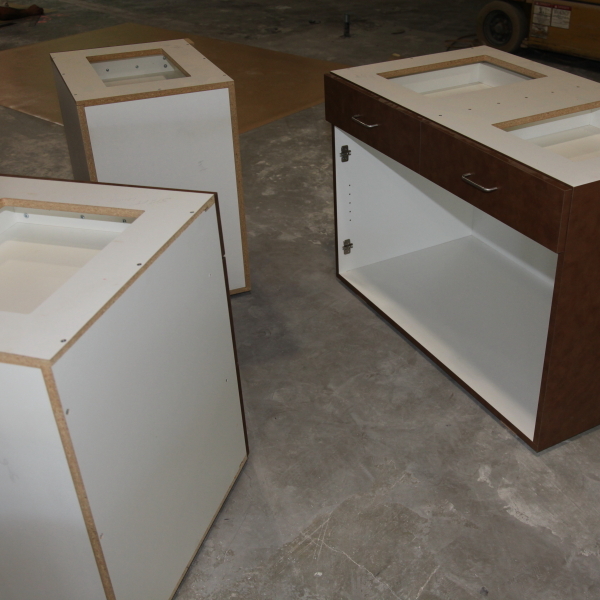 Linoleum and cabinets and colored paint. 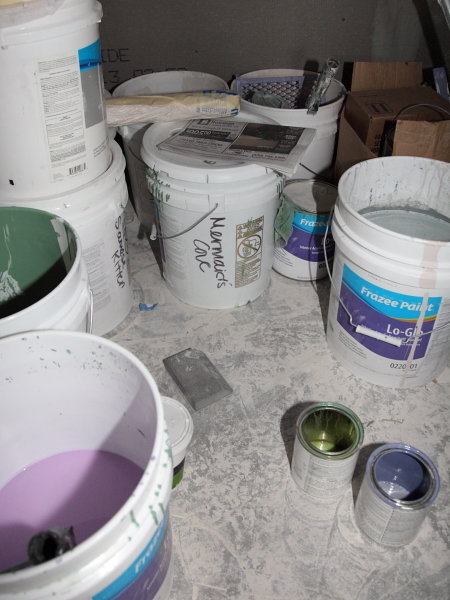 Color coordinating linoleum and paint. Using the special trowel to apply the glue and then tack down the linoleum. Hope this is not the new version of Forti-Flora, this stuff looks dangerous. View through one small animal room and into some others. Sun Tunnel natural light is joined by electrical lighting overhead to provide a nice kennel room. Working plans int he hallway. Careful work to join the linoleum. The special trowel and the glue. Steady hands and sharp knives are key to the linoleum installation. Great work guys. A critical component is letting people know how to navigate the building. More cool tool waiting for their turn. A couple of blogs back I mentioned the importance of all that ducting in the ceiling. I told you about how critical it was to keep the air clean and healthy for all the residents. 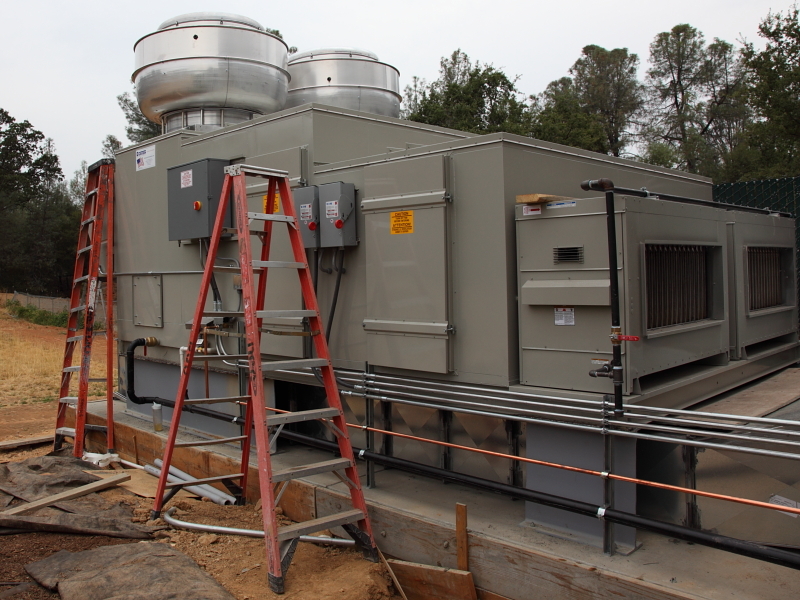 This past week they installed the big air moving and conditioning units that will do the job. This part of the construction is called HVAC. (Heating, Ventilation and Air Conditioning). Just how big is a system that can move all that air? For those of you inclined think like a cat, your household system is about like a house cat where as the New Shelter HVAC would be akin to a tiger or the prehistoric saber-toothed cat Smilodon populator (490 to 880 lb). For the dog people (I checked with some recent and exceptionally intelligent canine shelter residents for this information.) your household unit would be like a Terrier or at most a small Beagle and the new shelter system, it would be more like a Caucasian Ovcharka (110 to 200 pounds) or the giant mythical dog Cerberus who guarded the gates to Hades (Unknown size, surprise, no body took the risk to put him on a scale). To say this thing has teeth is an understatement and the analogies are apt. I will get some specs later but look at this big thing. It is truly impressive, and so necessary to keep the animals and people in a modern shelter healthy. Without it you might liken it to traveling in an airplane with some dude who has the swine flu or even Ebola. I am probably being a bit over dramatic, but the news lately, well thankfully cats don’t seem to get Ebola, but I’m feeling pretty bad for those folks out there in Africa right now. – Anyway, this HVAC, it’s real important to the shelter. Let’s move on to a more upbeat theme, color and paint. 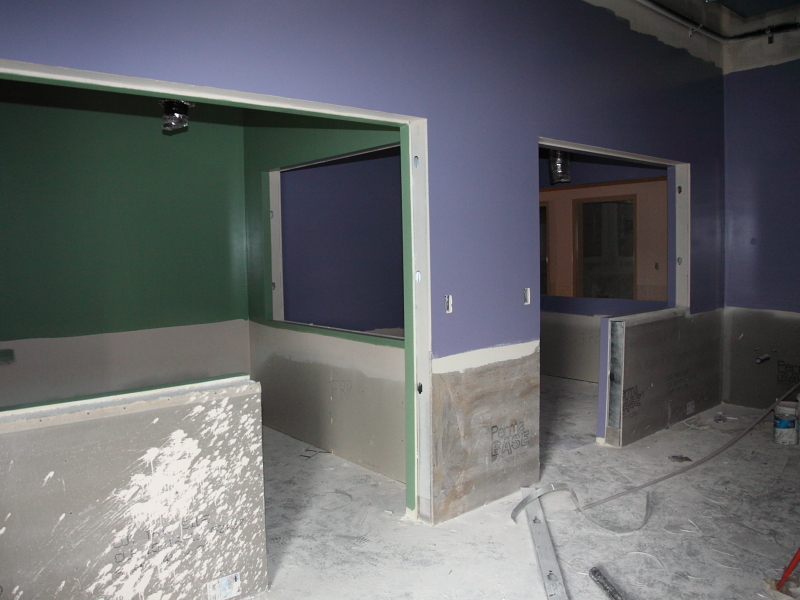 The new shelter is going to be a bright and cheery place. To go along with the Siamese Kitten color there is a lovely green color, Mermaid Cove. That made me think of something call Seagull Syndrome. But I will tell you about Seagull Syndrome next time. And, you may be wondering about how I know about colors since cats cannot see much color. I can see shades of gray and blue. But, if I can get pictures of stuff my deputies can provide me with hex codes that tell me exactly what color an item is with that. Every color has a unique hex code. Siamese kitten #eee2d5. Mermaid Cove is not listed at this time but as I said, it is a lovely green. You can look up colors at http://encycolorpedia.com There is also a striking blue/purple which I am thinking must be peacock something but it’s not confirmed yet. Please feel free to send your comments including guesses as to the actual name of this color. As for progress on the PAWED Finishing Touches campaign, time is rapidly running out to get a Donor Tile done in the first go round. August 16 is the deadline for this batch. I am awed but not surprised by the generosity of the PAWED members/donors and community members who have stepped forward to raise over $190,000 for my new home, i.e. the New Animal Services Facility. It is heartwarming to think that my fans are so incredibly generous. Thank You. Over here at the old shelter we are still pretty kitten heavy. Facebook angels have sponsored individual cats and dogs, PAWED has sponsored senior cats and dogs and also kittens. In July these helped get over 40 kittens adopted and 7 senior dogs as well as some adult cats. Take a look at the current adoptables on petharbor via Animal Services Adotption page, PAWED’s Facebook page, EDC Animal Services Facebook page and on the Mountain Democrat Friday Adopt A Pet page. Time for me to do some work, some new dogs just came in that need to be temperament tested and there is a litter of tuxedo kittens here that need some education as well. 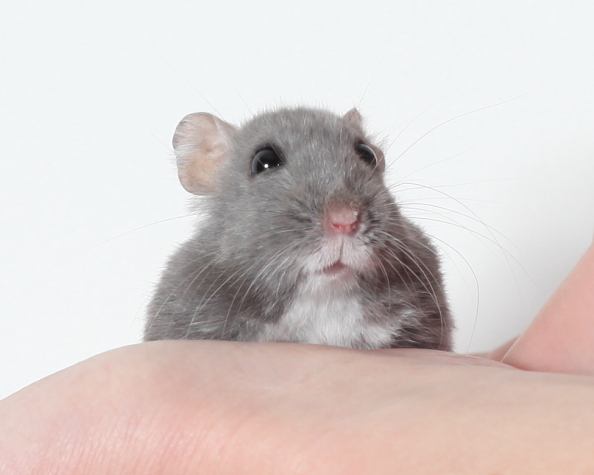 Then its Handsome sleep time, right after I test the water in the fish tank and agitate it a bit. Actual Current Blue Prints. Note they are black and white these days and no longer blue ink. My deputies always wear their hardhats while photographing at shelter. Long Hallway painted in Siamese Kitten along with the just installed wainscoting. Another specialty tool used to afix the drop ceiling to the actual ceiling without using a ladder. Textured dado and concrete board awaiting the next layer. Duct work, dropped ceiling and Sun Tunnels on a not so sunny day. Doorway to cat adoptions room, surrounded by cheery color.